Marcus Maddison wheels away after equalising for Posh against AFC Wimbledon. Photo: Joe Dent/theposh.com. 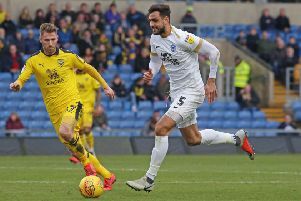 Peterborough United missed another glorious opportunity to make ground on the League One play-off chasers at the ABAX Stadium today (February 24). It’s a fourth successive draw for Posh who had to come from behind to gain a point against lowly AFC Wimbledon. Posh striker Jack Marriott is manhandled by Wimbledon defender Jonathan Meades. Photo: Joe Dent/theposh.com. The visitors looked set for all three points when Lyle Taylor shot them in front 15 minutes from time, but Marcus Maddison equalised for Posh within three minutes. A point from a 1-1 draw was the most Posh deserved from a largely shambolic display at both ends of the pitch. Posh boss Grant McCann urged his side to play with freedom and no fear before the game, but the players did the opposite in a first-half full of poor passing, no tackling and aimless hoofs forward. It was as bad as the home side have been all season. Fortunately they were playing one of the weaker teams in the league as Wimbledon wasted abundant possession and many promising positions with such poor decision-making Posh ‘keeper Jonathan Bond wasn’t required to make any saves. The visitors always had a useful outlet on the right wing where the gifted Taylor was up against teenage Posh left-back Lewis Freestone. Freestone was handed his first appearance of the season when Andrew Hughes failed a fitness test. Freestone did okay though. Taylor did skip past him once at each end of the half, but there was no-one available to take advantage of his crosses. Andy Barcham shot wide from 20 yards and Harry Forrester blasted over from a 20-yard free kick, while Posh appeared to be relying on Jack Marriott getting on the end of a long ball and then defeating some burly defenders on his own. Marriott managed it once, shrugging off the challenge of Adedeji Oshilaja, but visiting goalkeeper George Long was quickly out to block a hopeful shot. Ryan Tafazolli limped off at half-time with a hamstring injury and was replaced by Steven Taylor. Omar Bogle was also sent on as support for Marriott as Posh switched to a 4-4-2 formation. Posh improved slightly and should have taken the lead midway through the half when Maddison’s cross found Danny Lloyd unmarked six yards from goal. He mishit his shot and Chris Forrester then failed to beat Dons’ defender Barry Fuller with a great headed chance on the follow up. That looked to be a costly miss when Maddison’s poor pass was intercepted by Oshilaja who promptly played a long pass which defeated the Posh centre backs enabling Taylor to stride clear and score. Fortunately, and not for the first time this season, Marriott and Maddison combined to rescue a point. Unusually it was Marriott’s fine pass and Maddison’s excellent finish. Posh huffed and puffed for the rest of the game, but aside from a Maddison free kick, time-wasting goalkeeper George Long, was largely untroubled. Posh: Jonathan Bond, Liam Shephard (sub Junior Morias, 76 mins), Lewis Freestone, Jack Baldwin, Ryan Tafazolli (sub Steven Taylor, 46 mins), Anthony Grant (sub Omar Bogle, 46 mins), Chris Forrester, Leo Da Silva Lopes, Danny Lloyd, Marcus Maddison, Jack Marriott. Unused substitutes: Conor O’Malley, Joe Ward, Michael Doughty, George Cooper. AFC Wimbledon: George Long, Barry Fuller, Jonathan Meades, Adedeji Oshilaja, George Francomb, Nadjim Abdou, Harry Forrester, Liam Trotter, Andy Barcham (sub, Dean Parratt, 72 mins), Lyle Taylor, Joe Pigott (sub Egil Kaja, 72 mins). Unused substitutes: Joe McDonnell, Paul Robinson, Cody McDonald, Tom Soares, Callum Kennedy. Goals: Posh - Maddison (80 mins). Wimbledon - (Taylor 76 mins), Long (timewasting). Wimbledon - Forrester (foul), Long (timewasting).